Stretching is often overlooked but it should be a foundational component of your preparation and recovery. We’re not talking a rushed 5-10 min stretch before training but consistently integrating three to four, 20-25 minute sessions per week. This may sound a lot but be creative and integrate your routine into that time when you're watching TV or when you’re not batting in a match. 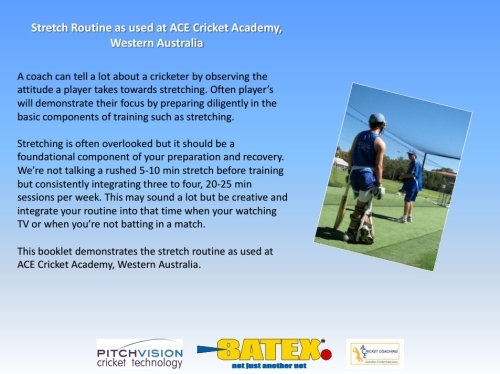 This e-booklet demonstrates the stretch routine as used at ACE Cricket Academy, Western Australia. Click buy to purchase your copy for instant download. Download the pdf document straight to your computer for instant access.